With the dismantling of encampments at New York’s Zuccotti Park and elsewhere and the onset of winter, the Occupy movement dropped out of front-page headlines. But the movement against greed and economic inequality has continued unabated, supported by members of the faith community. “It’s alive and well. I’ve never seen so much percolation going on. Just today there are four different meetings having to do with five different actions,” retired Episcopal Bishop George Packard said in a March interview with ENS. “Actions” – from street theater to interruptions of foreclosure procedures by singing protestors to weekly Wall Street marches – occur frequently, chronicled on Occupy Wall Street’s Facebook page, website and elsewhere. Earth Day on Sunday in New York, for example, will bring a “jazz funeral for the death of Earth as we know it” and a march to the site of the proposed Spectra Pipeline in the West Village. Faith groups in some cities led Lent or Easter events. 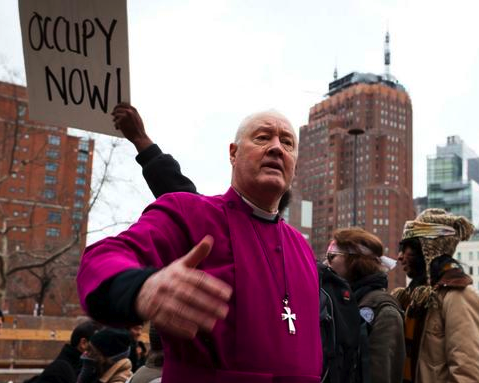 In late March, two priests from the Episcopal Diocese of Long Island and the founder of Protest Chaplains in Boston traveled to Oakland, California, to participate in a national Occupy Faith gathering. And movement supporters around the country are planning a day of action, including a call for a general strike, for May 1. Good deal - those who are in the business of spiritual health and growth should be speaking out against greed and corruption in a very public manner. The American Episcopal church has a long history of being on the right side of the issues. Kudos for their stand on this one, too.